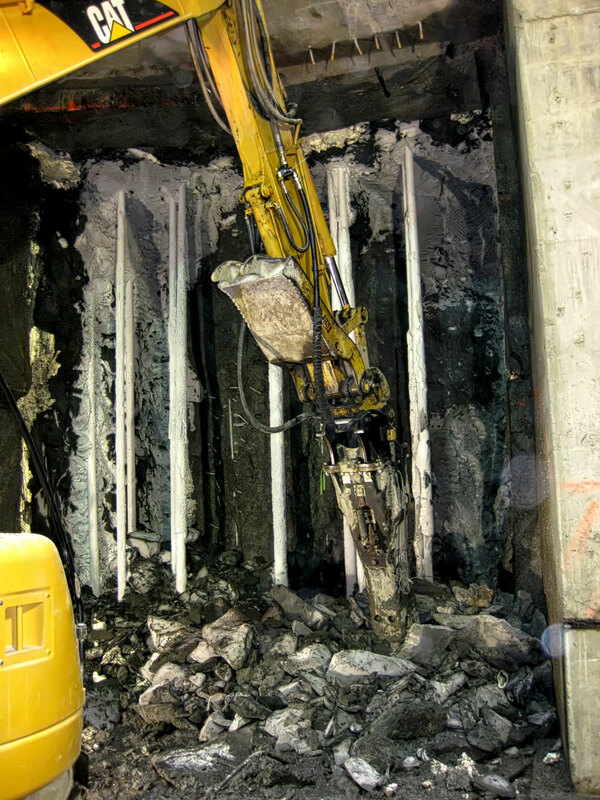 The East Side Combined Sewer Outflow (CSO) Tunnel project located in Portland, Oregon consisted of the construction of approximately 29,000 linear feet of tunnel, seven shafts and multiple pipe-line connections. An underground connection between two shafts, the newly constructed Port Center Shaft and the existing Confluent Shaft required ground modification in order to successfully complete the connection. 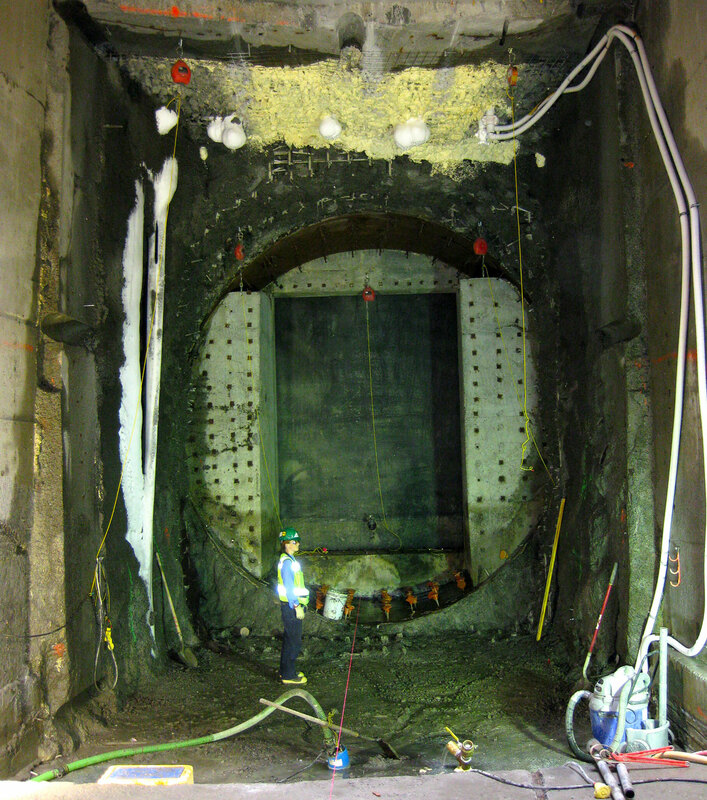 Moretrench’s scope of work for the Eastside CSO project involved providing a ground freezing system to assist in the mining of the tunnel between the existing confluent shaft and the new port center shaft. Soil stabilization by ground freezing was used as the necessary ground modification to complete this task. 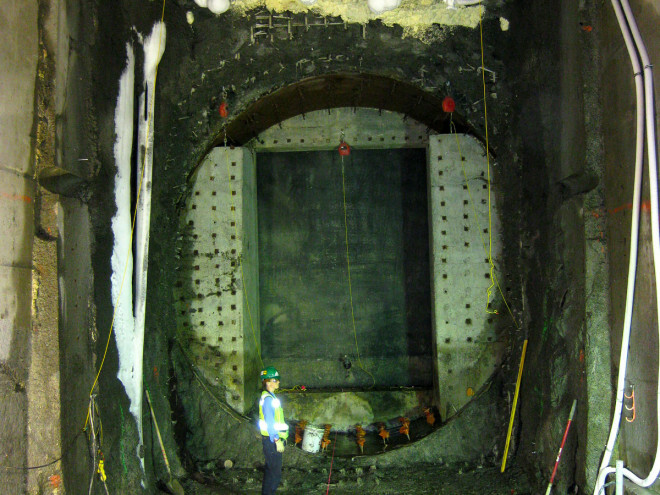 Moretrench’s design incorporated a grid of vertical freezepipes installed from ground surface to a depth of 140 feet. The vertical welded steel freeze pipes were installed using mud rotary drilling techniques. The upper portion of the freeze pipes were insulated with a plastic casing to minimize the amount of frozen ground above the area required for ground improvement. 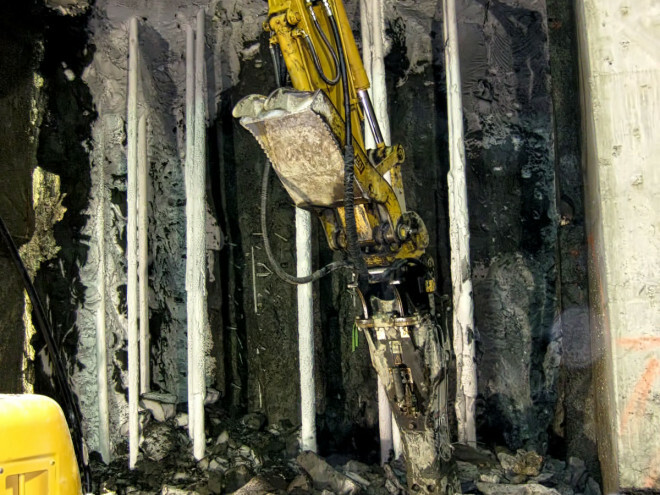 To ensure verticality of the freeze pipes, the drill rig was equipped with a heavy stabilizer. This system typically yields a borehole verticality of 1 percent or less. 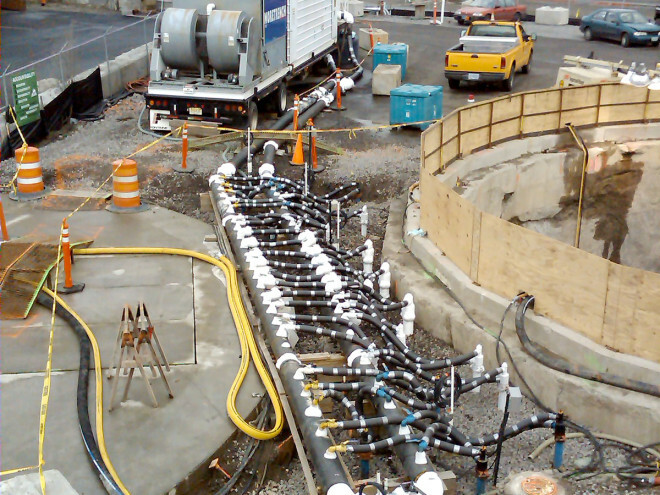 Each freeze pipe was connected to supply and return headers via a custom freezehead. The supply and return headers were piped directly into the refrigeration unit that circulated the coolant calcium chloride brine and delivered it to the freeze pipes, extracting heat from ground. The soil strength in the freeze zone varied with the distance from an active freezepipe and was typically between 800 to 1,500 psi. The monitoring program will consist of four temperature monitors and two piezometers. Temperature monitor pipes fitted with thermocouples at select depths to record actual ground temperatures were installed at select locations within and adjacent to the freeze area. During formation and maintenance of the frozen ground, the thermocouples were monitored on a daily basis to monitor the ground freezing progress. 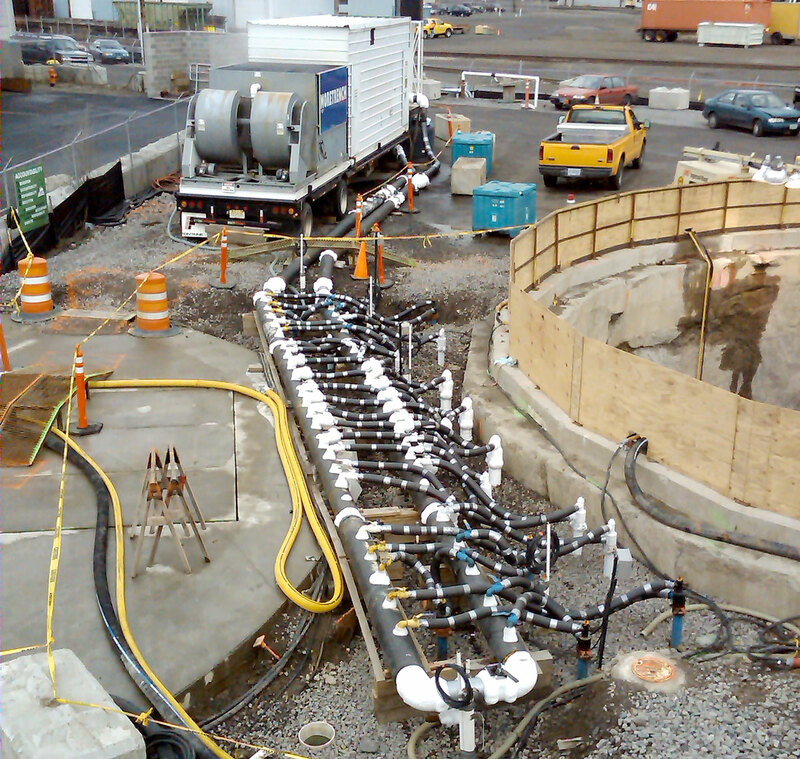 Piezometers were installed adjacent to the freeze area and were used to monitor the ground water regime at the work location. Upon completion of the work, the ground freezing system was turned off and the surface components of the system were removed from the site. The freeze pipes were abandoned by tremie grouting in place.